Many applications of stainless steel challenge the material and indeed the fabrication methods. To give value for money the type of alloy have to be carefully selected, and fabrication processes will have to be planned and performed so that the material will be able to perform close to its optimum. Although these problems are generally the same for all stainless steel equipment we will focus on pipe systems as the possibility to visually inspect the internal surfaces is more difficult in these. Components to contain aerated solutions with chlorides at intermediate pH from approximately 2 to 12 where pitting and crevice corrosion are the dominant corrosion forms have to meet strict requirements for the surface condition of the steel to avoid corrosion attacks. Equipment for pharmaceutical production, or food- and beverage plants have to meet accordingly strict requirements due to perhaps very aggressive cleaning solutions as well as for hygienic reasons and to prevent contamination from one production batch to the next. In production plants for microelectronics even stricter requirements may be specified to avoid detrimental contamination of the products. Fig1: Corrosion attacks in a heat tinted zone. Maintain full alloying even in the outermost layers of the surface, again this means no oxidation or heat tint also called discolourisation either reached by protection during welding or by post weld cleaning. Figure 1 shows an example of corrosion attack in heat tinted zone. 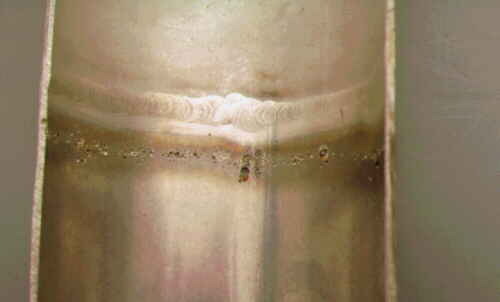 No current standard for welding of stainless steel contains quantitative requirements that could be used to specify the acceptance criteria for discolourisation in critical applications. Certain specific national standards e.g. DIN standards and the Baseler norm BN2 developed by a group of Swiss and German industries have more or less qualitative requirements. In Denmark most specifications are proprietary made by the individual companies but often with reference to recommendations from FORCE Institute. These recommendation are based on several projects on the correlation between oxygen content, amount of heat tint and reduction in corrosion resistance. These projects have shown that a close correlation exists between a chromium depletion below the oxide seen as heat tint and the drop in resistance to pitting - and crevice corrosion. The resulting degree of heat tint is affected not only by the residual oxygen, but also by several other factors especially a timetemperature factor govering the oxidation rate. The corrosion tests have verified that the critical limit of heat tint could be described as light straw-yellow. But as this description is somewhat vague and the limit rather sharp at some chloride levels a more quantitative scale had to be defined. From the photographs of welded test samples a scale of A to H was formed. A defines as no visible heat tint and H is the level where grey scaling so thick that it may detach during cooling. Level C is corresponding to the critical limit (straw-yellow/strohgelb). Fig 2: The difference between no heat tint and the appearance of a heat tint level causing reduced corrosion resistance. Figure 2 shows two different levels of heat tint. Have a heat tint not exceeding level C with reference to the FORCE Institute report 94.34/94.30(the latter in Danish). Such strict weld quality requirements are a challenge to the inspection systems as well. It is common practice to perform a radiographic examination of the welds, the extent of which may reach from a few percent up to 100% depending on such factors as pressure, temperature, content and how critical the pipeline is for the operation of the plant. By optimizing the X-Ray technique and film selection and by careful evaluation of the films by experienced inspectors a high probability of detection of porosity and other geometrical weld defects can be obtained. But for obvious reasons only visual methods are applicable when it comes to the evaluation of discolourisations and small surface defects, e.g. scratches, weld spatter etc. inside the pipes. Direct visual examination, if necessary with the aid of a dentist type mirror, of some welds on a pipe system, e.g. at flanges, may be possible, in particular during prefabrication. But otherwise equipment which allows a remote visual examination is needed. The FORCE Institute uses two different types of equipment for internal inspection of pipe systems: Flexible video endoscopes and miniature video cameras. The flexible video endoscopes (also named Videoimagescopes, VideoProbes, etc.) are available in probe diameters from 6mm to 16mm and with probe lengths up to 22m. For the majority of inspection jobs on stainless pipe systems a scope with a probe diameter of 8mm and a probe length of 3.5m has proven to be the most convenient. In certain cases we use a scope with a probe diameter of 6mm and a probe length of 7.5m. Illumination is provided via a fibre optic light guide built into the probe transmitting the light to the probe tip from a source housed in a box situated at the control end of the probe. A variety of light sources are available. When inspecting welds on stainless pipes for discolourisation a correct colour reproduction is of course essential. Therefore the light source has to have an appropriate light temperature, but also a correct adjustment of the white balance, whether automatic or manual, is important. We normally use a Xenon light source with a power of 300 w. Despite the fairly high power of the light source the range of illumination from a video endoscope is limited due to the small light outlet opening in the probe tip and the transmission loss in the probe. In most cases a probe tip adapter with a direct view lens with a field of view of approx. 100° is suitable. But sometimes shiny surfaces, in particular when inspecting pipes or fittings which have been electro-polished, may cause most of the light to get reflected away from the scope. This will make the surfaces appear almost completely black. This phenomenon can make the inspection very difficult and may lead to false interpretations unless the operator is very experienced. A side view adapter may help in such situations but will on the other hand make orientation more difficult when moving the probe through the pipe. The probe tip can be angulated, on certain models up to 150°, in 2 or 4 orthogonal directions. Thereby the direction of view and angle of incidence of the light can be changed to suit the situation. Also the manoeuvrability is greatly enhanced, in particular when entering a pipe system with bends. Depending on the pipe diameter and bend radius and whether the bends are in one plane or change direction out of plane the probe can travel through up to 5 bends. However, to avoid the risk of the probe getting stuck it is normally not advisable to go beyond 3 bends; and as a matter of course, suitable access openings for the insertion of the probe must be available. This together with the restriction imposed by the probe length calls for a careful planning and coordination of the welding and erection work and the inspection. The video endoscopes are normally used for inspection of pipes with diameters ranging from 20mm (straight pipes down to 10mm) up to 76mm. If larger pipe sizes are to be inspected some kind of centering device for the probe can be useful. Otherwise the inspection of pipes with diameters greater than approx. 50mm is performed with miniature video cameras. These are available in diameters down to 7mm. We normally use cameras with a diameter of 17mm. The sensitivity and image quality of these cameras is very high, and with a picture of more than 450 horizontal lines and 440,000 pixels the resolution is markedly better than with the video endoscopes, offering only around 90,000 pixels (new endoscope models with 270,000 pixels have been announced). The camera is connected to a Control Unit from which the white balance, sensitivity and shutter speed can be adjusted and from which the output signals to the monitor and/or video tape recorder are taken. The cable length between camera and control unit can be a limiting factor in some applications since the cable length for some camera systems is limited to only 2m or 5m. We prefer to use a camera type which can accommodate a cable length of up to 30m. Normally a cable of 15m is used. When using the miniature cameras for inspection inside pipes a light source is needed. We use a ring of 6 miniature halogen bulbs mounted around the front lens of the camera. The bulbs have a nominal operating voltage of approx. 3 volts and are fed from a variable power supply. A slight overvoltage will help achieving a light temperature sufficiently high to give a good colour reproduction but will on the other hand reduce the life of the bulbs substantially, so it can be necessary to compromise. Readjustment of the white balance of the system may also help giving an acceptable colour reproduction even at relatively low light temperatures. Some of the newer camera models are quite good in this respect. To provide an assembly with sufficient stiffness to allow insertion into a pipe by pushing, the cables supplying the camera and the bulbs are passed through a corrugated plastic tube which at the same time protects the cables. The plastic tube also gives a low friction so that it is possible to push the camera up to 20 m into a straight horizontal pipe. But it must be admitted that the manoeuvrability of the assembly and its ability to pass bends is very limited. 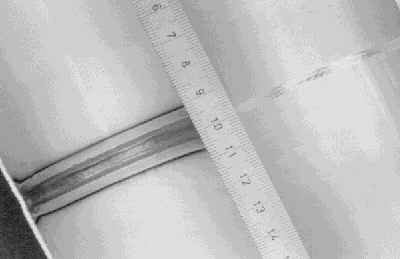 The results of the video inspection, whether made with endoscope or miniature camera, are documented on video tape. The video signals are passed through a text generator so that information about the plant, weld number, inspection date etc. can be superimposed for reference. When inspecting a larger pipe system normally only the "highlights", showing unacceptable discolourisations and other features of interest, are recorded. The video tape is handed over to the customer as doumentation together with a written report. Pharmaceutical Fluid Systems is a section of Novo Nordisk Engineering (NNE), which is an independent engineering company owned by Novo Nordisk A/S. Novo Nordisk produces pharmaceuticals (Insulin main product) and industrial enzymes. PFS is dealing - at the mechanical side - with projecting, installation, testing and documentation of "Clean" piping systems within the production of pharmaceuticals. The pharmaceuticals treated in this context comprise sterile solutions, being processed in tanks and pipe systems. These main requirements lead to a comprehensive set of detailed requirements, some of which are treated in this context. It is also a general requirement from the health authorities and quality departments, that quality activities must be documented. This plays a major role in the subjects of this document. In general, these liquids do not contain extremes from a corrosive point of view. Rouge is the most frequently encountered corrosion phenomenon. As such, the requirements mentioned below primarily serve to optimise properties concerning purity and sterility. All together, the above mentioned requirements lead to the application of molybdenum containing stainless steels of the AISI 316L type, whereby the welds and inspection hereof play a central role. The surfaces must of course be as smooth as possible. Often Ra roughness values of approx. 0,5 µ are prescribed, sometimes combined with electropolishing. The requirements for the welds naturally focus on the appearance on the inner surface. We are not aware of investigations showing a specific correlation between the degree of discolourisation and influence on our specific products. As a practical approach, we refer to the Reference Chart from FORCE Institute, accepting the levels A, B and C.
It may be seen from the above mentioned various requirements, that the strict demands to the product quality and the pipe work, combined with requirements to well documented quality activities, lead to an extensive control work associated with the welding process. The welding quality control is - as shown earlier - focused on the appearance of the inner surface of the welds. The most widely used inspection method - and generally the only method available for testing properties of the surface of the weld - is the visual inspection and evaluation of the weld and weld zones. The extent of control and documentation methods are discussed and differ in various projects, but the tendency moves towards a 100 % visual inspection, enhanced by endoscopy and documented in video recordings. During erection, identification of each weld is marked on the pipes, whereby the corresponding video recording can be accordingly identified. In many projects, the control activity is organised in such a way, that NNE has the direct responsibility regarding the customer, whereas the contractor carries out the welding control in the first hand. NNE may then choose to make spot tests of the quality work made by the contractor. It is sometimes argued, that these control activities do not make the welds nor worse nor better, but perhaps the most useful effect is to act preventive to the contractor, leading itself to better welding practices. The fact, that each weld is carefully inspected and may be shown later to anybody, is an encouraging element in the daily work. To this can be added, that NNE gets a fixed point of reference in relation to the user about the implementation of the pipe work, so that any possible problems later in the production and cleaning process suspect to be caused by the welds, can be discussed on an objective basis. "Corrosion of Metals; Corrosion of Metallic Materials inside of Tubes, tanks and Apparatus under Corrosion Load by Water; Evaluation of Corrosion Likelihood of Stainless Steel", DIN 50930 Teil 4. 1993.
" Baseler Norm", BN 2. "Arc Welded Joints in Steel - Guidance on Quality Levels for Imperfections", EN 25817. "Reference Colour Charts for Purity of Purging Gas in Stainless Steel Tubes". FORCE Institute, Report 94.34. "Corrosion Failures in Stainless Steel Pipe Systems", Tube International, May 1997.